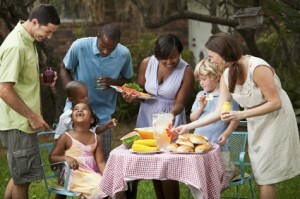 The Washington, D.C. area features families from a variety of racial, ethnic, cultural, and religious backgrounds. Children who grow up in this region have a wealth of opportunities to learn about other cultures and gain skills to get along in our increasingly multicultural world. At the same time, a diverse environment can pose unique challenges for children. Explicit, age-appropriate discussions about differences can greatly assist children to navigate their often complex multicultural environments. Many well-meaning parents are concerned that pointing out differences will lead to prejudice. But research suggests the opposite; even young children notice differences in skin color the same way they see the differences in hair and eye color, height and weight and gender. Studies suggest that parents who speak openly about differences such as skin color and heritage, and openly encourage friendships with children from different backgrounds, can have a major impact on their children’s attitudes and their ability to get along with others. Parents can also assist their children by talking about the realities of discrimination and prejudice. Research suggests that addressing this issue directly can generate dramatic improvements in children’s abilities to get along with others who are different from them. In a study by Rebecca Bigler of the University of Texas, half the children in an elementary-age classroom read stories that included the racial hardships the heroes faced, such as the taunting that Jackie Robinson endured. The other half of the children read more neutral material. After two weeks, the children who read the stories with explicit material about racism had markedly improved attitudes toward African-Americans as compared to the other group. When parents engage in explicit, age-appropriate discussions about diversity with their children, they can foster positive attitudes and skills and enhanced friendships, and the atmosphere in schools and neighborhoods can change for the better. Phyllis Katz, University of Colorado in 2003 (two hundred African American and Caucasian children observed from six months old until six years old. Finding: six month old babies stared longer at photos when the faces were of a different race than their parents). Birgitte Vittrup Simpson, University of Texas, doctoral dissertation 2007 (one hundred Caucasian children aged five to seven years olds in Austin, Texas. Finding: although parents were embracing of diversity, the children were not aware of whether their parents wanted them to have African American friends). Vittrup asked the parents of these children to talk explicitly with their children about race, which most parents didn’t do because they found it hard. Those parents that talked explicitly about race had children who had markedly improved attitudes within one week. Po Bronson and Ashley Merryman (2009). “Why White Parents Don’t Talk About Race,” NurtureShock, (New York: Twelve.) The chapter is excerpted in Newsweek, Sept. 2009. Birgitte Vittrup Simpson (2007), “Exploring the Influences of Educational Television and Parent-Child Discussions on Improving Children’s Racial Attitudes,” Dissertation, The University of Texas at Austin.